GReads! : Author Interview: John Corey Whaley + GIVEAWAY! 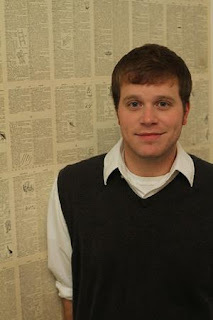 Author Interview: John Corey Whaley + GIVEAWAY! One of my favorite new authors stopped by the blog today to answer a few questions about his debut novel, Where Things Come Back. It's a story that struck an emotional chord with me, and has lingered in my mind weeks after finishing. Corey so graciously accepted my request for an interview, for which I was beyond excited to get inside his mind to pick a part different aspects of the story; as well as get to know the author behind this fabulous book. And guess what else? Be sure to check out the GIVEAWAY at the end of this interview, which happens to be INTERNATIONAL (as long as The Book Depository ships to you!). Now that I've read, reviewed, and LOVED this book -- I want to share it with all of you! Where did the idea for Where Things Come Back first evolve? Can you share with us some of your thought processes during those early days when the story first began taking form? When I was a senior in college, in 2005, I heard a story on National Public Radio about the possible reappearance of the Ivory-billed woodpecker. This, accompanied with a song by my favorite singer, Sufjan Stevens, led me to construct the initial idea for Where Things Come Back. I had wanted to, for years, tell a coming-of-age story about a teenager in the small-town south, and when the idea of placing that teenager in a town gone mad with woodpecker mania came about, I knew it was the story I had to tell. Over the span of a year, I wrote some, tossed some, re-wrote some, and finally had about the first fourteen pages of the novel written by the time I had graduated college and taught public school for a year. Then, having sat with the idea for long enough, I wrote the rest of the novel in about a month and a half. The characters in this story are written with distinct voices, in my opinion. Did you draw inspiration from people in your own life as you were writing them? Do you see yourself in any of the characters? Well, Cullen Witter is definitely inspired by some aspect of my teenage and adult self. His cynicism and wild imagination come directly from me. Much of Gabriel, the younger brother, also comes from aspects of my personality and some of the ways I acted as a child. His obsession with music and neckties, for instance. As far as drawing inspiration from people around me goes—I would say that I definitely became more aware of my environment, my small hometown, as I was writing this novel and I surely used a lot of things that were heavily influenced by my upbringing. Music is a huge passion in my life. I know you have a playlist for the book, care to share any favorites and what they represent to you? Sure. Several songs were constant inspirations for me during the process of writing this novel. One actually started the entire thing—“The Lord God Bird” by Sufjan Stevens. This song is about the possible re-appearance of the ivory-billed woodpecker in Brinkley, Arkansas in 2005. My novel deals with the Lazarus woodpecker’s possible reappearance in Lily, Arkansas, and is taken directly from the real-life story. Another song that meant a lot to the story is “Staring at the Sun” by TV on the Radio. There is a particular moment in the story when Cullen’s family members all seem to be at their lowest points—specifically his mother, who is stuck with the difficult decision of trying to move on in life without her youngest son and with no clues to his whereabouts. This song jumped out to me as I was writing a pivotal scene that expresses the mother’s desperation and sadness. Cullen has an active imagination with a Peter Pan-like desire to stay young. If you could be Cullen’s age again for just one day, what would you do? Peter Pan-like desire to stay young? HAHA. I actually think Cullen cannot wait to grow up and move on, but it’s an interesting read on his character. If I could be 17 again, which sounds terrible actually, I think I would try to go an entire day without being cynical and sarcastic and without reveling in the hatred of my hometown. I would, hopefully, be able to retain much of the maturity that the last ten years have brought me and see the world as a place that isn’t out to get me. The fictional town of Lily in the book has a Lazarus burger, but it’s just a number three without cheese. What would you put on a Corey Whaley burger? A Corey Whaley Burger? Wow. I’ve been waiting for this question my entire life! I would put the only things I ever eat on a burger. It would be a burger, very well done, with Swiss cheese and mayo only. Now I’m hungry. WTCB has recently gotten a lot of well-deserved praise in the book industry. Have the awards and recognition sunk in yet? What has been your favorite moment thus far? You know---just when I think one has sunk in, something else seems to pop up. It’s crazy how that works. I have been so humbled by all of the attention and praise that WTCB has been getting lately and I hope that I show that when I talk to people about it or re-tweet good things, etc. It’s a strange thing to suddenly get a lot of attention from important people when one has pretty much flown under the radar for his entire life. But, I’ve got to say: I love every second of it. There is nothing more satisfying than knowing that something so important to me (WTCB) actually means something to others out there as well. My favorite moment so far? It would be hard to top the moment I got to read an excerpt from WTCB for the National Book Foundation’s 5 Under 35 party last week. I was introduced by Oscar Hijuelos, who selected my novel for the honor. It was surreal and so very awesome and a lot of the amazing people at Simon and Schuster who worked on the book were there and it was such an honor to share in the celebration with them. Who do you consider as your writing mentors? What advice might you give to someone who is seeking to become a published author? Mentors? Hmmmm…That’s a tough one. They always get me with the questions about inspiration and mentors. HAHA. Honestly, I am heavily inspired by the works of other writers who have devoted their careers to telling compelling, literary, and moving coming-of-age stories. Writers such as Sherman Alexie, J.D. Salinger, Stephen Chbosky, David Levithan, Frank Portman, and Jonathan Safran Foer. These writers number among the many that I draw inspiration from in terms of trying to tell stories about teenagers whose lives are complicated and unique, who have varying issues to deal with and who struggle to find their places in the world. These are the kinds of stories I’ve always wanted to tell. As far as advice to those seeking publication, I say this: Don’t stop trying. If you’re good (and hopefully you will know you’re good…if not, give someone smart and well-read who has no emotional attachment to you something of yours to read and measure their response) then you should always keep writing and never stop trying to share your work, as long as that’s what you want to do with it. I write things that I intend to never publish, so don’t get overwhelmed when something you love is looked over by an agent or editor. Just try again or write something new. Treat writing like guitar practice…fine tune your craft and keep at it. I almost gave up and one week…ONE WEEK…was the difference between being a published author (my lifelong dream) and continuing to do something I didn’t want for years and years to come. You just released the cover art for the paperback edition of WTCB. I have to say, it’s definitely a favorite of mine! What other book covers do you (or would you) frame as art in your home? Oh…I love this question. First off…I fully plan on framing the paperback cover as well (to accompany my framed hardcover poster). Second, I have several that spring to mind---covers that I have loved for years. They are from novels by Jonathan Safran Foer, of whom I am a huge fan. Everything is Illuminated and Extremely Loud and Incredibly Close. To see the paperback edition of WTCB, click here. To listen to the playlist for the book, click here. *** GIVEAWAY IS NOW CLOSED! - thank you for entering! Thank you Corey for taking the time to answer my questions. As I've said numerous times, your work amazes me and I can not wait to read what you are working on next! Wonderful interview, Ginger. You chose some awesome/insightful questions. I just added this book to my TBR! Great questions, Ginger! I mean, it's no surprise, but it still bears mention. I LOVE Sherman Alexie, and I can certainly see where some of the inspiration for this style of writing might come from someone like Alexie. I am even MORE interested to check out this book! The paperback cover is amazing. So amazing. Although the hardcover reminds me of Still Life With Woodpecker by Tom Robbins...maybe that's the point? Also, peeped that playlist and I am dying - DYING I TELL YOU - at the Jenny Lewis mention. Acid Tongue is such a fabulous song AND album. As is Jenny Lewis with The Watson Twins. Her voice moves my heart. Thanks for the interview, you two!